Mathias Goeritz was born in Danzig, Germany (now Poland), on April 4th, 1915. He spent his childhood in Berlin where he studied medicine, before studying philosophy and later on getting a doctorate degree in art history from the Friedrich Wilhelms Universitat (now the Humbolt University). He studied drawing at the Berlin Charlottenburg School of Art. Some of his friends and colleagues were the sculptor Ernst Barlach, painter George Grosz and draughtsman Kaethe Kollwitz. It is known that he left Germany to live in Tetuan, Morocco in 1941 and then Granada, Spain in 1945. 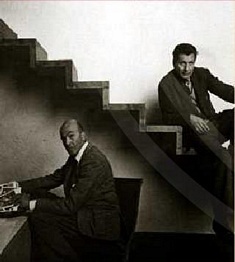 In 1946 he had a large exhibition in the Sala Clan in Madrid under the pseudonym "Mago". Two years later, living in Santilla del Mar, Spain he was a founder of the Escuela de Altamira. Of Jewish descent, he found refuge from the Second World War in Mexico where in 1949 he was invited by Ignacio Diaz Morales to be a part of the faculty of the School of Architecture at the Universidad de Jalisco. In 1953 he wrote the "Manifiesto de la Arquitectura Emocional" (The Emotional Architecture Manifesto), where he points out that only achieving true emotions from architecture can it then be considered an art form. This same year he founded the Museo del Eco in Mexico City. He was one of the artists who brought with him new vanguard ideas from Europe during the 50's. A Dadaist, constructivist and expressionist, Goeritz collaborated with Luis Barragan to make El Animal and the famous Torres de Satelite, also with the help of Chucho Reyes, in Mexico City. In 1968, Mathias Goeritz organized the Ruta de la Amistad for the Mexican Olympic Games held that year. His monuments and murals can be seen in numerous places in Mexico and the United States, and his work has been exhibited in countless cities around the world. Mathias Goeritz, an artist who influenced a whole generation of young geometrists in the sixties and seventies died in Mexico City on August 4, 1990.